Pokemon The Series: Sun & Moon, which is currently being broadcast on CITV, may be the latest Pokemon anime TV series but those wishing to take a trip back to the Unova region will be excited to learn that the TV channel POP Max, formly known as KIX!, have now started broadcasting episodes of Pokemon: Black & White on a daily basis. 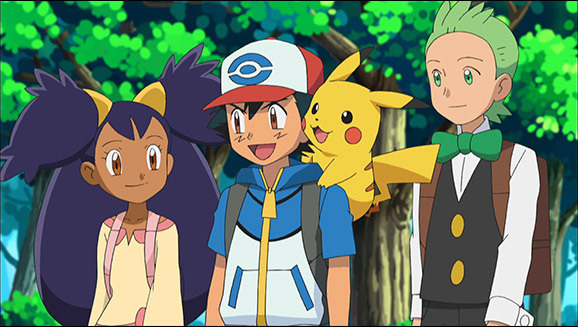 Available on Freeview Channel 208, Sky Channel 627 and Freesat Channel 604, Pokemon fans will be able to rexperience the adventures of Ash, Pikachu, Iris, Axew and Cilan as they venture round the Unova region making new friends and collecting gym badges. Synopsis: Ash and Pikachu are off to the distant Unova region, where they’ll face a new land, new rivals, new challenges, and all-new Pokémon! They can always count on their new friends Iris and Cilan, but Ash still needs plenty of new Pokémon on his team if he hopes to win to beat the gym leaders and win the Unova league. As it stands three ‘new’ episodes will broadcast each weekday at 8am, 8:30am and 9am; while these same episodes will be repeated again at 4pm, 6:30pm and 7pm. These ‘timeslots’ may change on a monthly (if not weekly) basis as we move from the ‘new year season’ to regular schedule’; but we can expect all 50 (or so) episodes from the first ‘series’ of the Black and White timeline to be broadcast within a timely manner and in order. It’s worth noting that POP Max also currently broadcasts Beyblade Burst on a daily basis during the day while in the early hours of the night/morning the second season of Dinosaur King is being broadcast. In any event Pokemon: Black & White is currently being broadcast every weekday on POP Max and for the meantime you can check out the TV Advert below.